Have you ever seen plastic food? You can see it in restaurant show windows throughout Japan, and it looks just like the real thing. These pages show how plastic food is made and used in Japan. Written by Sanada Kuniko, Photos by Sugawara Chiyoshi, Collaboration: Iwasaki Co., Ltd. Above: The day before the imitation food is made, the factory obtains the real food prepared by the client. 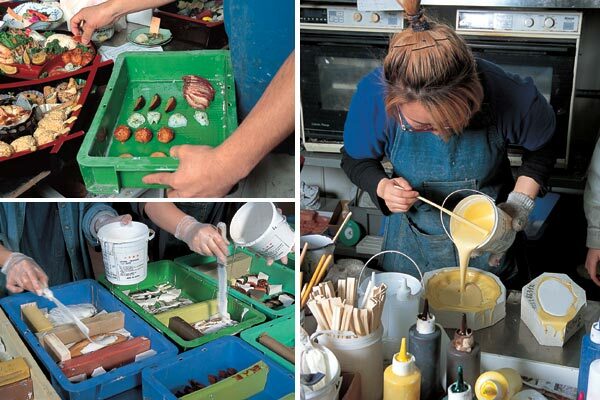 Each piece of food suitable for making a mold is placed in one of the molding boxes. Below: Silicon is poured over the food in the molding boxes. When the silicon hardens, the molds are ready. Right: Liquid plastic is poured into the silicon molds to make an imitation omelet stuffed with ketchup-seasoned fried rice. The casting is then heated in an oven to harden it. Models of food were first made in Japan in 1917. Six years later, a restaurant in a famous Tokyo department store displayed some imitation food in a glass case, and then enjoyed a big jump in revenue. In those days, the imitation food was made the same way as wax plants and anatomical models. In 1932, Iwasaki Ryuzo set up a business to make and sell food models. The company, Iwasaki Co., Ltd., did very well, and is now the top manufacturer of plastic food. The staff there was happy to show us how this "food" is made. Standing in the vast manufacturing area, you might think you are in a huge restaurant kitchen, not a plastic food factory. Almost 50 people are either working on ingredients for Japanese, Western or Chinese restaurants, or making different types of beverages. Rice is placed on a dish, then topped with a thick curry sauce and placed in an oven. Workers cut sushi rolls with a knife. At least, that is how it looks at first. But there are no nice smells coming from the ovens. How is the "food" being made? A company representative, Kurokawa Yuta explains, "In the old days, imitation food was made from wax. The wax was melted, then poured into molds made from kanten, which is a kind of seaweed jelly. Today, the molds are made of silicon. We take the molds and pour liquid plastic into them, then heat the plastic until it hardens. The new materials and techniques make the models more convincing than before."